The National Steering Committee (NSC) for the Concrete Industry Management (CIM) program — a business intensive program that awards students with a four-year Bachelor of Science degree in Concrete Industry Management — set a new record raising more than $1.2 million in gross revenue at its annual auction, held in conjunction with the World of Concrete on Wednesday, Jan. 23. 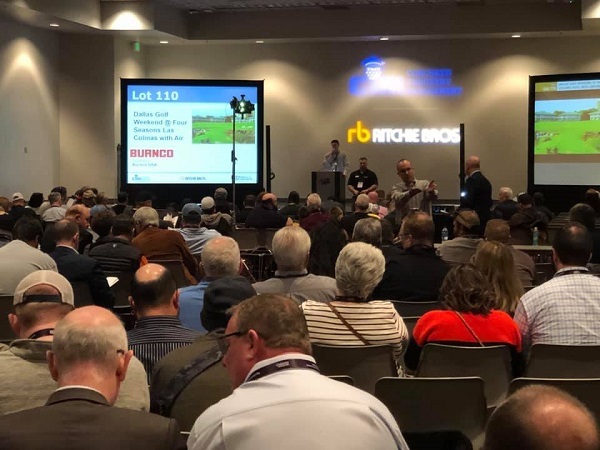 The 2019 CIM Auction featured two ready mix trucks, including: a Mack Granite Bridge Formula mixer donated by Mack Trucks, Inc. and equipped with a Beck Industrial mixer; and a 2019 Kenworth T880S truck with a Con-Tech Manufacturing bridge-formula rear-discharge BridgeKing mixer. In addition to the live auction, a silent auction was also held. This year CIM had record proceeds from the silent auction. Auction items included cement, concrete saws, drills, mixers, vibrators, safety equipment, screeds, decorative concrete tools, water meters, pumps, generators, training sessions, reference books, iPads and laptop computers, sports travel packages and golf and vacation travel packages. Again this year, NSC partnered with GiveSmart — a user-friendly bidding technology service providing customized auction and event solutions primarily for nonprofit organizations. With GiveSmart, participants were able to register for the auction, sneak preview silent and live auction items, make a donation, and bid on their favorite silent auction items immediately. Once again this year, participants who were not able to attend the live auction were able to bid online during the event.